They may sleep in the park, but they eat like kings. Hundreds of grimy protesters laying siege to Wall Street and stuffed into the now-smelly Zuccotti Park dine each night on gourmet meals prepared by a former hotel chef using only the finest organic ingredients. 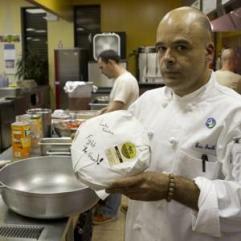 “We’re running a five-star restaurant down there,’’ crowed Eric Smith, 38, the ex-le Chef de Tournant at the Sheraton in Midtown, who works out of a soup kitchen in East New York, Brooklyn, churning out the meals for more than 1,000 protesters every day. “The other day, we made some wonderful salmon cakes with dill sauce and some quinoa salad and a wonderful tomato salad with fennel and red onion,’’ he said. So last night, for example, while your family of four may have been forced to resort to Hamburger Helper, thanks to Smith’s culinary magic, hordes of Occupy Wall Street protesters instead feasted on organic chicken, spaghetti Bolognese, roasted beet and sheep’s milk-cheese salad and wild heirloom potatoes. Most of the produce, grass-fed meat and organic chicken is donated from small organic farms upstate, including Northland Sheep Dairy, West Haven Farm and Wide Awake Bakery in Ithaca, and several farms in Connecticut and Vermont. When food is ready for the protesters, a driver collects crates from each of the cooperative farms and drives to New York City with a truckload of goodies. . . .
A driver then picks up the meals, and the food is served by 7 p.m. Monday to Saturday. Also of note, some fancy New York restaurants which survive and flourish because rich people dine there–well, those restaurants are morally supporting and donating gourmet food to the Occupy Wall Street thugs. I wish we had a list of all the restaurants that donated so we could urge a boycott of them. Essentially, the rich people who eat there are subsidizing–by paying for their own expensive meals–the free meals these restaurants give to the OWS whiners. Then, there’s even this from the New York Times, which admits that the OWS crowd gets expensive food donated by rich donors from around the world, primarily in Europe and on the West Coast. AFTER nearly two weeks of living among the Occupy Wall Street protesters in downtown Manhattan, Ellis Roberts, 25, a Pennsylvania garbage collector laid off last year, looked scruffy and dazed. He was not, however, hungry. Like the rest of his anti-corporate comrades, Mr. Roberts learned soon after arriving in Zuccotti Park that his meals would be taken care of. . . . Last Thursday he had encountered “a bunch of Katz’s Deli sandwiches,” he said. “That was good.” . . .
Because city law prevents open flames in the park, and because the menu relies on that steady but unpredictable supply of donations from home cooks, food trucks, farmers, restaurants and markets, what appears on any given occupier’s paper plate can be more of a cross-cultural mishmash than the menu at the Dutch. If politics makes strange bedfellows, it makes even stranger flavor pairings. Since the protests began in September, nearby restaurants have experienced a strange uptick in phone calls and online orders, many of them coming from other parts of the world. Telly Liberatos, 29, the owner of Liberatos Pizza on Cedar Street in the Financial District, said he has received orders from places like Germany, France, England, Italy and Greece, as well as every region of the United States. “It’s been nonstop,” he said. “The phones don’t stop ringing. People from California order the most at one time.” Someone from the West Coast had called in the biggest delivery: he wanted 50 pizzas dispatched to the park. . . .
At Katz’s, the deli on Houston Street, “thousands of dollars” in Occupy Wall Street orders have been coming “from customers who are sympathetic to the cause,” said Alan Dell, one of the owners. The deli has sent pastrami, brisket, corned beef and turkey sandwiches, as well as heaps of pickles, potato salad and coleslaw. “The potato latkes don’t travel well because there’s no way to heat them up again,” Mr. Dell said. Now and then, the park’s kitchen gets lucky. Bob Reich, who once worked for Birdbath Bakery in Manhattan, appeared in the encampment a few minutes before 7 p.m. bearing bags of freshly baked cookies. “The ingredients are as organic as we can get them,” he said. PUH-LEEZE. And I thought the dessert was Occu-PIE Wall Street. So I guess the occupiers are a combination of spoiled rich people who will go back to patronizing fancy restaurants when this is over, and degenerate bums who have a great opportunity for free handouts, like never before. I’m sure it is also a haven for psychiatrists who are trying to buttress their declining practices by getting new, disturbed patients. And does Whole Foods donate? It is good to be an Anarcho/Marxist demonstrator. I wonder if the next compromise will be to let the lumpen proletariat bed down in a five star hotel so they no longer have to camp out? Our friends do have leisure class tastes, don’t they? OWS reminds me of OWN as an acronym. I am waiting for the protester reality show. This restaurant should be boycotted by PAYING customers!!! Correction that this chef should be boycotted when he becomes employed again!!! Who is paying for these meals if this jerk is unemployed? What part of “donations” don’t you understand? Or is the concept of donations not part of your elitist vocabulary? 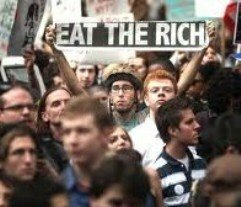 Leftists like capitalism – when it fills their stomachs! The chef appears to work for Sheraton Midtown. I wonder if Sheraton appreciates what he does in his off-hours. Classic socialists/communists: Biting the hand that feeds it. These people (“the protestors”) are really nothing more than extortionists…In my humble opinion. Can someone tell me: Where has Mayor Bloomberg been in all this? Is it not his job to enforce public order? The guy is worth billions, yet he’s scared of using his authority to remove a mob whose extended presence in a public space constitutes a health hazard. You expect a Kosher meal – from crowds that are largely Judeophobic? Now if only somebody would donate them free soap, so that one wouldn’t have to smell them. Oh, and force them to take a dip in the Hudson while they are @ it. Why doesn’t the Chef hire some of them if he thinks so much of them? If Sheraton doesn’t fire him,then shame on them, too. The Vermin will not triumph. They, like their allies the Paul-bots, will fail. Oh yes, they live like kings on their concrete thrones in their royal tents. What utter nonsense. Yes, they get occasional donations from people who support their cause, but how does eating make a protester a hypocrite? I suggest anyone who claims this, get off their memory foam pad and 1000 thread count sheets and hit the streets for a night. Then, maybe you can actually say something. 50 pizzas would feed one slice to how many people? 500? How many thousands are there? If this were a group who matched your ideals, and people were making donations for food, their generosity would be held up as examples of the group’s message resonating with the public at large. That to me is the true hypocrisy in this article and the one by Washington Post. If you ask me, this article and much of the mainstream media coverage has been to dismiss and discredit the protesters without even considering what they are saying. The issue is not capitalism itself, but banks that create problems like the housing bubble and who then take money from taxpayers and give it to their CEO’s and those already making millions. There are plenty of people like me, who think capitalism is a good thing, but that what he have is a diseased imitation of free markets. Another OWS issue is campaign finance. Politicians have been talking about it for a decade from both sides and what has actually been done? And, before you make assumptions about me, I’m a lifelong republican who reluctantly voted for McCain in the last election. There are many other further issues I’d also like to raise, but I know they will just fall on willfully stubborn ears who would rather not have to think critically.